Current Affiliation: Research Scientist at INRIA in the ALCOVE team. I am currently mainly interested in exploiting new highly parallel architectures such as GPUs in the context of interactive simulations for medical applications in particular. See my Research page for more information, or look in Publications and Videos for recent results. 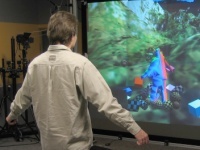 In 2006-2007 I did a PostDoc in The Sim Group @ CIMIT/MGH, working on a new open-source medical simulation plateform: SOFA. I obtained a Ph.D. in 2005 at Laboratoire Informatique et Distribution with Bruno Raffin about high performance virtual reality using clusters.